Cinema, built in the 1960s. Originally 1500 seats. Later converted to a multiplex, also known as "Djakarta XXI". 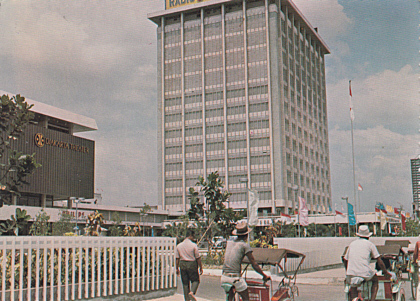 Front Text: inscription on very left building: "Djakarta Theater"
Reverse Text: "Modern cinemas are mushrooming in Djakarta"